Voting at Labour’s conference is by weighted vote, each delegate gets a book of voting slips and some votes are decided by collecting the voting slips and counting them. Each vote is worth the number of members in the affiliate divided by the number of delegates. For instance my card vote this year was worth about 380, about 3800 members, divided by 10 delegates. This is known as the card or block vote. These booklets of votes are not sent by post but must be picked up in person at a “Regional Briefing” starting at 9:00. In previous years this meeting has been used by regional staff to influence new delegates. Two things happened at our briefing; the lack of clarity of the regional staff was not good although they almost made it clear that delegations were dispersed amongst the London block and not sitting together which makes consulting other delegates in the delegation harder than it should be. More importantly, they had failed to have card votes printed for four of our delegates inc. me and did not have the IT available to make new ones. We were told to go to the balloting office, but the queue was immense and we would have missed the start of conference. (It’s obvious why they distribute the cards in regional briefings as they can have nine queues as opposed to one.) Anyway, I entered the Conference Hall without a card vote book. Since the first item of business is the acceptance of the CAC Report which includes the agenda, timings, the inclusion and exclusion of contemporary & emergency motions and includes any rulings on consequential changes on the agenda. i.e. if the democracy review packages pass, which of the other rule changes fall without debate. This is always controversial and this year the Chair announced that any vote would be taken by show of hands, and if unclear, by hand in parts (i.e. Unions & Affiliates separately from CLPs) and then if it remains unclear a card vote would be taken. The CAC had proposed that the Democracy Review would be taken on the Sunday, and that the other rule changes taken on the Tuesday; they also recommended that all the rule changes on the subject of Parliamentary Candidate Selection proposed by CLPs would fall if the NEC proposal on the same subject passed. The NEC were proposing a variation of the trigger ballot reform which meant that the two rule changes proposing its abolition, i.e. open selection would fall without debate, or more accurately fall without being moved. It’s hard to predict what would happen, but it was expected that nearly all the Unions (50% of he vote) would vote with the CAC so the question was how many of the CLP would vote against them and here we were, with a bunch of London delegates without their card vote books. As the card vote was called, I tried to move a point of order to explain some of us could not vote as we didn’t have our card votes; I was told that the chair wasn’t taking a point of order during a vote, I called out that my point of order related to the conduct of the vote but was still told to sit down; on my way back to my seat Len McCluscky asked me what the problem was, and when I explained, said “That’s not right!”. At our seats, those of us without votes made voting slips, but without much hope of them being counted. The Chair then announced that the Ballot Office now had London’s missing card votes and that the ballot boxes would be kept open for another 15 minutes, so we got our votes in. I have had a look at the rule change motions amending rule C5.IV.5, Selection of Westminster Parliamentary Candidates, which will be on the agenda for Labour’s Conference 18. They were submitted last year, and thus scheduled for debate this year. I have written up my thoughts in an article/document. the role of party units or branches in a nomination process. By considering the issue of whether to have a trigger ballot process at all as separate from the protection given to incumbents,i.e. the threshold, I think we gain clarity. 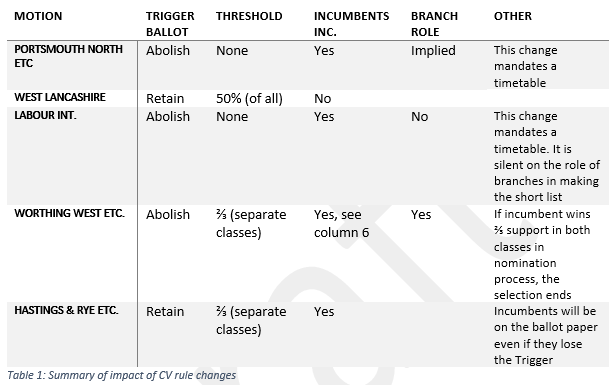 Another reason for considering them separately, is that the abolition/retention of the trigger ballot is proposed with thresholds, either having an early termination of the reselection process or for avoiding the reselection processes all together respectively. Rachel Godfrey Wood has also written a summary of how she sees the amendments although she does not consider the West Lancashire amendment which changes the rules such that, if an incumbent loses a trigger ballot, they are not to be included in the subsequent selection. There’s a good reason for this. If the Conference Arrangements Committee rules that only one of these rule changes can be carried, then passing the West Lancs motion means that there is no change to the trigger ballot process, and it can’t be debated for another five years. The paper also points at two other rules changes, abolishing the rule on auto-exclusion for supporting a non labour organisation, and on CLP finance, where it is proposed that the CLPs get 50% of the membership fees. CLPs & Affiliates may only submit “contemporary” motions to conference. Contemporary, as in timeliness, is taken as an issue, that has arisen since the publication of the NPF report and more controversially that could not have been raised before. In 2016, the CAC ruled motions on austerity and the economy out of order as these had both been in existence in the spring. The words themselves permit the raising of an issue on which the NPF is silent, such as my proposed anti-surveillance motion. Authors of motions need to take these rules into account. IV.1.D all affiliation fees shall be paid by end of the year. IX.1.B Affiliation fees due to this CLP for the previous year ended 31 December must have been paid to this CLP a clear 35 days before the date of the annual meeting. IX.1.C. New affiliations accepted at least 60 days prior to the AGM in the current year shall have all rights associated with attendance at the AGM. The Labour Party’s financial year is the calendar year. If not paid in the year of account, an affiliate falls into arrears on 1st January of the following year. It must pay the arrears by 35 days before the AGM, otherwise it may be treated as a new affiliate and pay 60 days before the AGM. This could be easier. but it would seem there are two routes for dealing with arrears. My submission to Labours Democracy Review on making policy. CLPs should have an inalienable right to initiate policy, as such CLPs should be allowed to submit motions to Conference on policy as they see fit (i.e. not be constrained by the NPF report and processes). NEC should publish their minutes so that members know what they are doing. Appropriate CLP motions should be presented to the NEC and their actions recorded, minutes taken and reported to the authoring CLP. CLPs should be able to submit a motion + rule change to Conference during the same year and CLP/Affiliate proposed rule changes to conference to should be allowed to be debated at the Conference for which it was proposed. The NPF to be halved in size, meet more regularly, report to conference, and conference to be extended by a day. This is designed to increase the NPF’s accountability to Conference and provide some form of governance over continuous policy making; Conference should remain sovereign. NPF should be commissioning hearings led by a combination of grassroots activists and members and workers/trade unionists with expertise in specific areas. NPF should function in a more transparent way. This transparency to include its web site. Conference should be a day longer, it would allow the consideration of more topics. My submission to the Democracy Review on Electing the Leader. Required nominations in the case of a vacancy should be set so that the electorate are given a choice. It should be noted that the higher the threshold required within the PLP, the more likely pressure for reselection will be in cases where MPs no longer represent the views of their membership. On electing our leader, the Leader should be elected by individual ballot, of individual members, affiliate members and registered supporters. Registered supporters should be asked to renew their commitment annually (and undergo the same checks that are used for people to become members), charged no more than of the order of £5 per year and be able to attend (but not vote during) branch meetings. If Toby Young seeks to become a registered supporter, we should refer it to the Police for fraud.